Share the ride on a bus, train or carpool at one of hundreds of free Park & Ride lots all over the metro area. Browse the list to see lots located in your city. You'll also see the transit routes you can take from each lot. NOTE: Overnight parking is not permitted at most Park & Ride lots. There are no Park & Ride spaces at Mall of America. Overnight parking spaces are available at suburban Northstar stations for up to seven nights. Find the Park & Ride lots nearest you by using the Stops & Stations tool on the homepage or Interactive Map. Exit Hwy. 55 at Bloomington Rd; follow signs to parking (south and west of Whipple Building). UPDATE - Twins fans: Please consider using 28th Ave. Station Park & Ride for remaining weekday afternoon games. Fort Snelling Park & Ride has very limited space due to the I-35W construction project. Evening and weekend games are not experiencing space limitations. Spaces are available at each Northstar Park & Ride lot for overnight parking, for no more than seven days at a time. East of Hwy. 10/169 off 171st Ave. NW. North of Hwy. 10/169, east of 4th Ave.
For information about carpooling from Park & Ride lots, contact Commuter Programs at 612-373-3333. 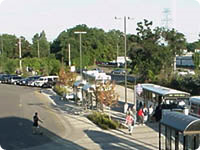 Blaine Northtown Transit Center 150 Northtown Dr. NE 10, 25, 805, 824, 825, 831, 852, 854, 860 West side of mall, west of Perimeter Rd. Excelsior Excelsior City Hall 336 Water St. (3rd St. & Water St.) 670, 671 North side of Water St.
Hopkins Hopkins Park & Ride 10201 Excelsior Blvd. (Co. Rd. 3 & 8th Ave. S.) 670 South side of Co. Rd. 3 at 7th Ave.
W. Eagle Lk. Dr.) 780 North end of the lot adjacent W. Eagle Lake Dr.
Minnetonka Blvd. 16020 Minnetonka Blvd. 667, 671 North side of Minnetonka Blvd. Oakdale Hadley Avenue & Upper 17th St. 2002 Hadley Ave. N. 294 NW corner of Hadley Ave. & Upper 17th St. N.
Richfield Knox Avenue Park & Ride 7601 Knox Ave. 535, 539 South of Best Buy headquarters, off Knox Ave.
River Falls WIS 35 & WIS 65 (St. Croix Co.) WIS 35/36 No bus service End of Park & Ride Rd. West St. Paul West St. Paul Sports Complex 1650 Oakdale Ave.